With three hearts and blue blood, its gelatinous body unconstrained by jointed limbs or gravity, the octopus seems to be an alien, an inhabitant of another world. It’s baggy, boneless body sprouts eight arms covered with thousands of suckers—suckers that can taste as well as feel. The octopus also has the powers of a superhero: it can shape-shift, change color, squirt ink, pour itself through the tiniest of openings, or jet away through the sea faster than a swimmer can follow. But most intriguing of all, octopuses—classed as mollusks, like clams—are remarkably intelligent with quirky personalities. This book, an inquiry into the mind of an intelligent invertebrate, is also a foray into our own unexplored planet. These thinking, feeling creatures can help readers experience and understand our world (and perhaps even life itself) in a new way. Keith Ellenbogen is an award-winning underwater photographer with an emphasis on environmental conservation. His images have been published worldwide in newspapers, magazines, and books as well as on TV. He is a Senior Fellow with The International League of Conservation Photographers (iLCP), a Fellow with the Explorers Club, and an Assistant Professor of Photography at the Fashion Institute of Technology / SUNY. 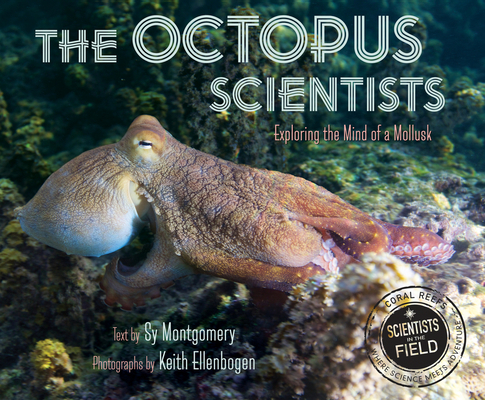 * "Chapters of action, with smoothly integrated explanatory background, are interspersed with informative passages about octopuses, the field station, and coral reefs...Amazing photographs reveal the octopuses' remarkable shape-changing abilities and help readers visualize this experience. Science in the field at its best." "Montgomery describes all aspects of life in the field, including the personalities and quirks of the scientists and the joys of working in a beautiful tropical locale. Abundant stunningly clear underwater photographs highlight the colorful details of a range of marine species." * "Through sharply crafted text, Montgomery shares her enthusiasm with readers, and Ellenbogen's vibrant color photos allow a crystalline window into a very special environment...Another enticing entry in a series devoted to highlighting enthusiastic scientists hard at work in the fields they love." "The reliably informative and entertaining Montgomery is off on another Scientists in the Field adventure."